what part animal would Ты be? I Would be part-snow-leopard Have Feline Devilish eyes and a soft white tail and ears. MUAhAHAHA Get out the TUNA. I'd be part Penguin. Why Penguin? Simply put... penguins are cool. Panda because they are cute and AWESOME!!! well my favourite animal is a girafe but i cna't pick that so i asked my Друзья and they сказал(-а) i would be a лиса, фокс или a волк but i don't know why ? 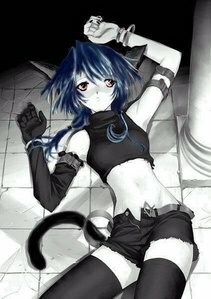 A cat girl neko of corse :3. I can't choose! I'd either be a tiger, a white lorikeet, a bottlenose dolphin, a babboon, или a graceful butterfly! Those are the Животные my characters are infused with. so... ya.